There is nothing like a private Lake Loft while you are hunting, fishing or just spending time outdoors. And with our beautiful new Lake Loft, you will be in touch with nature while enjoying all the amenities of home. 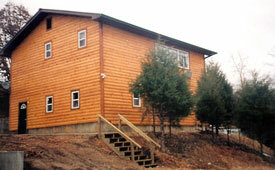 Our new Lake Loft sleeps up to 4 comfortably while offering central air and heat. It features a double stall bathroom with a standup shower, spacious kitchen quarters (includes refrigerator, oven, microwave, coffee maker, pots & pans and all utensils) and a comfortable living room with satellite TV. All bed linens and bathing towels are also provided. The nicest aspect of the Lake Loft is the breathtaking view it provides. The oversize viewing window gives you an unbelievable look at the big game approaching the lake, located only fifty yards away. The lake is well stocked and our guests are invited to try their luck with the Bass, Bluegill, Crappie, or Catfish. The lake is catch-and-release and Don’t Forget to bring your own Tackle! The Lake Loft is available, during the months of May, June, July & August, for a Family Summer Vacation.